'HeartLights' Frosted Glass Heart Candles (Set of 4) - EconoBride - Budget friendly wedding favors. 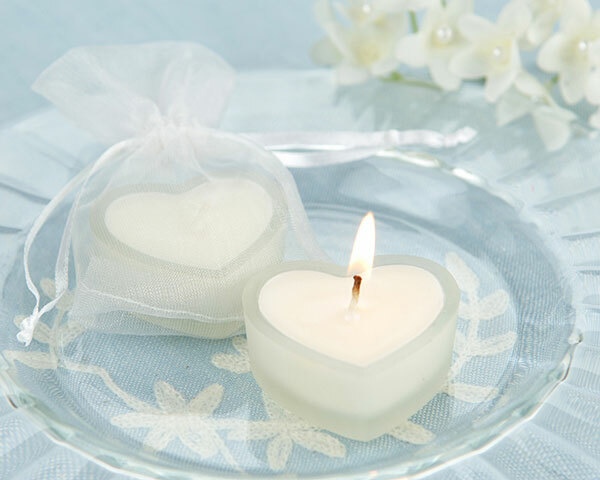 Light your guests� hearts with these classic frosted glass scented heart candles. Each glass heart candle is packaged in an elegant sheer white organza bag for a lovely presentation. We also suggest spreading some of these heartlight candles around as table decor to cast a romantic glow over every place setting. Candle measures 2" at the widest point x 1 1/2" in length.